I finally had to retire my old canvas bag which I picked up back in 2004. After a bunch of looking around, Ask Metafilter suggested a Tom Bihn cafe bag, which turned out to be about perfect. I got the medium, linked back there, but you can really see the details (and the color I got) in these pictures of the small size. Alright, meme time, what's in your bag? 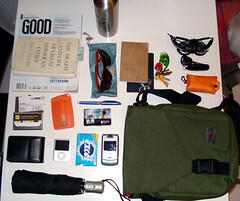 Wallet or wallet-like pouch (containing various ID, bank, and mass transit cards and money), cell phone, extra cell phone batteries, keys, sunglasses, hair clip, bandages, Nintendo DS and accessories, portable chopsticks, water bottle. This is actually a pretty small load! Portable chopsticks! I had a set of those once. Now I have to find another! outer pouch: lighter, house keys + secureid fob, car keys. other side pouch: samsung blackjack. underflap outside pouch: gum, little lint roller, fountain pen, sharpie, gel pen, moleskine, passport, travel tissue packet, little box of tiny origami papers, hearing aid storage pouch. main pouch: wallet, bottle of ranitidine, bottle of , tylenol, bottle of darvocet (tylenol for daily use, darvocet for real pain), makeup bag (makeup, safety pins, nail nippers, breath strips), nintendo dslite (in case with accessories), creative:zen m 80g, frizz-ease hair creme, tissue, driving glasses. my current bag is too big and encourages carrying too much stuff. it's cute and i like it but it's a bit unwieldy. plus i'm a sucker for cute messenger bags! I know what you mean! I carried my Timbuk2 bag every day I'd need a chiropractor on call. That reminds me: Under the washing directions on my new bag, it reads "Siquid mantica non capit, domi relinquendum est" -- if it doesn't fit in your bag, leave it behind! Another book to read in case the first runs out. Way too many pens for no good reason. Plus, unwisely, both of my name stamps: one for the government, one for the bank. Name stamps? Hanko? I guess I never really realized that they saw common use, and weren't just souvenirs for tourists. red ipod nano engraved with "4A696D6D79206C6F7665732050616D6D79"
Okay, I can't shoot nyxie. She's too cute! I cannot believe you replaced your BlackBerry with RAZR!? :) Where is it, huh? Re: Where is your BB? Haven't hade one for a year -- it was Mitel's, and it was my on-call pager so it's nice to be back to a plain old phone again. I thought about getting another at FreshBooks (or an iPhone) but I don't want to be that connected.